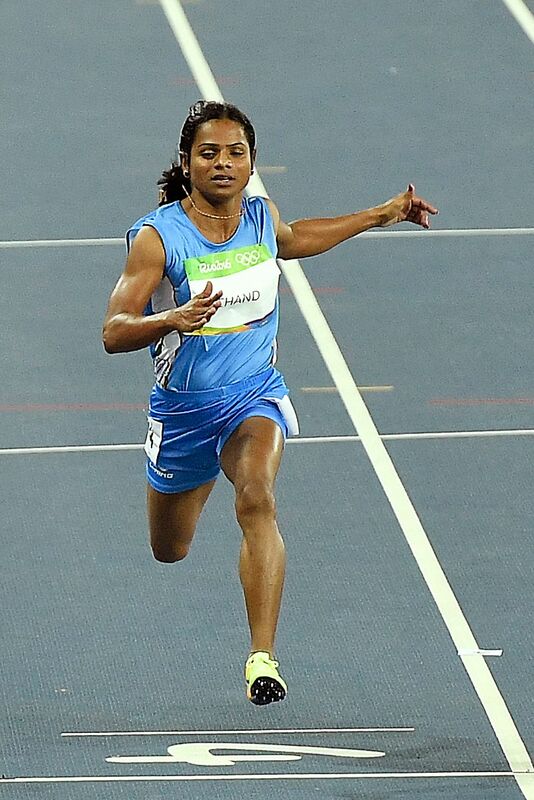 Dutee Chand, who missed the original entry standard got an invite from the IAAF as the target number of 56 athletes for the women's 100m event was yet to be reached. NEW DELHI: Sprinter Dutee Chand on Saturday got the confirmation to take part in the World Championships after the top tribunal of international sports suspended the policy of the international athletics federation, which had barred her from competition, by another two months. The 21-year-old Dutee, who missed the original entry standard of 11.26 seconds, got an invite from the International Association of Athletics Federations (IAAF) as the target number of 56 athletes for the women's 100m event was yet to be reached for the August 4-13 World Championships in London. Dutee's best of 11.30 seconds, which she clocked during the Indian Grand Prix in New Delhi on May 15, has now earned her a 'quota entry' for the World Championships. Her 11.30secs timing gives her a current global ranking of 103. The IAAF yesterday sent an invite to the Athletics Federation of India, asking to reply in 'yes or no' about accepting the offer and the AFI, after taking consent from Dutee, had responded within the stipulated time that she was ready for the global flagship event. It has come as an advantage that Dutee is already having United Kingdom visa. "Yes, Dutee is taking part in the World Championships. The AFI has said yes to the IAAF invite. Why would she not accept the offer? She is ready and she is also happy to be able to take part in such a big event," Dutee's coach Nagpuri Ramesh told PTI. AFI Secretary C K Valson added: "Dutee has been cleared to take part in the World Championships. She currently has a UK visa, as we had told all those in borderline timings (of qualifying standards) to apply for visa. The 24-member team has already left the country and Dutee will most likely leave alone for London in a direct flight." Meanwhile, in her 'gender case' before the Court of Arbitration for Sports (CAS) in Lausanne, Switzerland, the world's top sports tribunal has suspended IAAF's Hyperandrogenism Policy, under which the AFI suspended Dutee from competitions in 2014. The top tribunal said today that Dutee remains eligible to compete in national and international events. Dutee's future was under a cloud after the IAAF recently decided to submit fresh evidence at the CAS in support of its policy of barring female athletes who produced natural testosterone (male hormones) above permissible range from taking part in competitions. In July 2015, the gutsy Odisha athlete got the ban imposed on her by the AFI overturned as the CAS partially upheld her appeal. The world's top sports tribunal had given time of two years to the IAAF to produce conclusive evidence that female athletes with high levels of naturally producing testosterone have an unfair advantage over their peers. That period of two years ended on July 24 and after the IAAF approached the top sports tribunal recently, it was decided by the parties involved in the case to further suspend the policy for another two months. "Based upon the agreement of the parties and at the approval of the Panel, the Hyperandrogenism Regulations have been suspended for an additional two months. During such extended suspension, Ms Dutee Chand remains eligible to compete in both national and international level athletics events," the CAS said in a statement. "Should the IAAF not file any scientific evidence within the additional two-month period granted by the CAS Panel (i.e. end of September 2017), the Hyperandrogenism Regulations will be declared void," it added. Giving a background of the case, the CAS said, "On 24 July 2015, the CAS issued an Interim Award in the arbitration procedure between the Indian athlete Dutee Chand, the Athletics Federation of India (AFI) and the International Association of Athletics Federations (IAAF). "The CAS Panel in charge of the procedure (The Hon. Justice Annabelle Claire Bennett AO, Australia (President), Prof. Richard H. McLaren, Canada, and Dr Hans Nater, Switzerland) suspended the 'IAAF Regulation Governing Eligibility of Females with Hyperandrogenism to Compete in Women's Competition' (the "Hyperandrogenism Regulations") until 24 July 2017 in order to give the IAAF the opportunity to provide the CAS with scientific evidence about the quantitative relationship between enhanced testosterone levels and improved athletic performance in hyperandrogenic athletes."